To play the game you have to choose your table limit. Then press on one of the coins in the bottom of the table, and on the area where you want to place your bet. Press Spin. 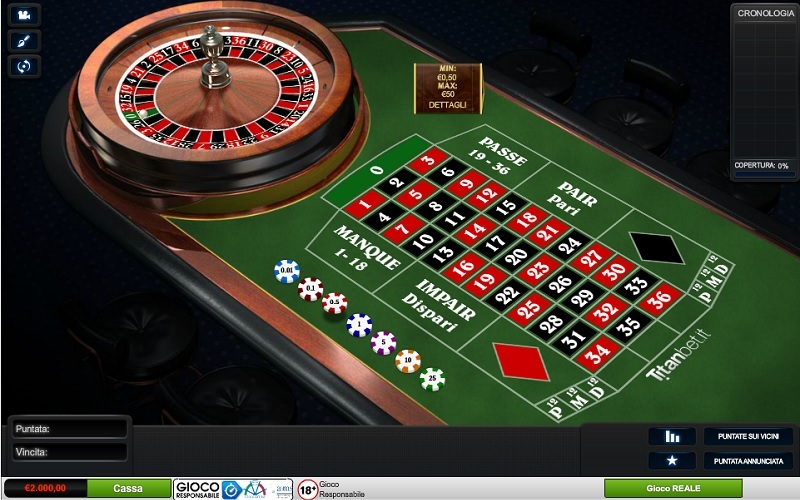 Playing French roulette at 888Casino.com includes free game play money and high bonuses for first depositors. Before you play for real money try our free flash game online. French roulette is one of the three main variations of roulette, along with European and American Roulette. The first thing you will notice about a French roulette table is that it actually does have some French writing on it. Even if you do not speak French, you should have a reasonably easy task of translating the words on the table by where they are positioned. 'Impair' is placed above the word 'Odd', 'Pair' is positioned above the word 'Even', 'Manque' is displayed above the numbers 1-18, and 'Passe' is located above the numbers 19-36. This roulette variation is more closely related to European roulette than American roulette with the presence of only one '0' section on the wheel. This means that the odds of winning are identical to those on the European variation. Europa Casino Premium French Roulette offers the player smooth graphics with the roulette wheel, table and chip stacks all on display on one screen. When placing a bet, the player must select the number of chips from their chip stack that they want to bet and must then select the section of the table that they want to place the bet on. Once the player has selected where they want their bet to go, a number of options will appear. The 'Undo' button allows the player to cancel their previous bet in case they bet an incorrect amount. The 'Double' button gives the player the option to double the number of chips they have placed down already without having to go through the whole process of selecting chips and selecting the area of the table they want to bet on again. The 'Spin' button obviously gets the whole spinning of the wheel and ball process started. The final button is the 'Clear Bets' option where the player has the chance to wipe clear all the bets they have placed and start afresh if they are not comfortable with the bets they have placed before confirming the spin. When the spin is complete the female croupier voice will confirm where the ball has landed and an image of the ball on that section of the wheel will be shown just below the wheel once it has stopped spinning for validation. The player is then presented with the chance to either 'Double and Spin', 'Rebet and Spin' or simply to 'Rebet'. One cool little feature on this game is the ability to stop the wheel whenever you want, to speed up play rather than having to wait for the ball to stop rolling around the wheel. This gives the player the chance to get through more spins at a faster pace. However, some players do love the intense drama that comes with waiting to see what section of the wheel the ball lands on. There are a few other fascinating little features on this game. If the player hovers over an area of the betting table then a little window will appear to display what odds that section of the table pays out. The maximum and minimum betting box not only displays how much you can bet but it also offers information on what odds different types of bets can pay out. The wheel history also gives the player the chance to see what numbers have come up on previous spins. The most unique feature for this game is the inclusion of the opportunity to place neighbour bets and announce bets.